New power management technology is rewriting industry standards for reliability and power consumption of solenoid valve coils. 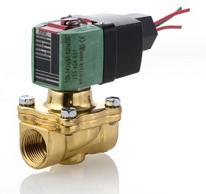 The new technology solenoid valves accepts both AC and DC voltages while improving performance. Available in 2-way, 3-way and 4-way, these solenoid valves are designed to handle most fluid control applications. The enhanced valves are designed to be drop in replacements for existing valves. There is no change to functional attributes such as flow, pressure, ambient & fluid temperatures or physical attributes such as envelope size and face-to-face dimensions. If you're looking to just switch out a coil, enhanced coil kits are direct replacements for the old coil kits. Also suitable with devices having leakage currents not exceeding the drop-out currents noted above. Contact Mead O'Brien at (800) 892-2769 or visit http://www.meadobrien.com for more information.